These decadent, easy S’mores Bars are made with whole grain oats, graham crackers, and cashew butter for a healthier spin on the classic! With a rich chocolate layer and gooey marshmallows, kids and adults of all ages will adore these bars! Vegan and gluten-free option. We may have less than two months left of summer but we’ve got unlimited months of s’mores!!! Ya see, home girl doesn’t have a fire pit. I have wooden skewers and bags on bags of chocolate and ‘mallows but no big open flame. Enter homemade S’mores Bars with a smorgasbord of all the s’moreiest ingredients—no fire pit required!! I still haven’t gotten over my Cookie Dough Protein Bars. Like, I’ve been making and polishing off a batch every week since I posted them. So when I randomly bought graham crackers and marshmallows at the store, my brainy wheels started turning. S’mores bread? Bars? Cake? Pancakes? Cookies? Cheese balls?!!? IS YOUR LUNCHBOX EVEN READY FOR THESE?! 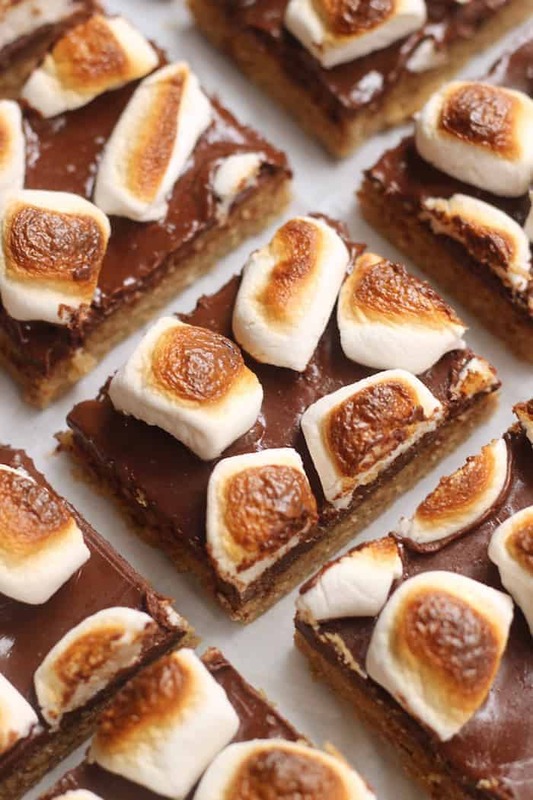 These super duper kid-friendly S’mores Bars are quite timely because we’re heading into back to school season whilst hanging onto summer for dear life. It’s campfire spirit meets lunchbox. It’s fun meets functional. What could be better?! Today I’m partnering with my great friends over at Bob’s Red Mill to show you that conquering back to school season doesn’t have to be so tough. Whether it’s packing wholesome and happy lunches for the kiddos or fueling ourselves, we’re on team “work smarter, not harder.” These S’mores Bars are most definitely the smartest, most delicious decision I’ve made this season. They’re made with whole grain old-fashioned oats (use gluten-free if needed), graham crackers (use gluten-free or vegan ones if needed), cashew butter, and of course the most epic chocolate + marshmallow combo for a healthy yet still totally drool-worthy spin on the classic. Fiber, plant-powered protein, brain-boosting fats, and enough chocolate to make it through seventh period math class…checkcheckcheckcheck. Breakfast bars on the go? Lunchbox treat? Dinner when nothing else sounds satisfying?? You really can’t go wrong here. I guarantee that these babies will be approved by taste buds of all ages. If not, you get to eat them all yourself. Lucky you!! Line an 8×8 inch square baking dish with parchment paper going both ways. Place oats and graham crackers in a food processor or blender (I used my Nutribullet). Process until a flour-like consistency is achieved. Dump into a large bowl and add salt, stirring to combine. Add maple syrup, cashew butter, and almond milk. Stir until you have a ball of “dough.” Using wet hands, press evenly into prepared baking dish. Make chocolate coating by placing chocolate chips, coconut oil, and cashew butter in a medium microwave-safe bowl. Microwave in 20-second intervals for about a minute, or until melted, stirring each time. Pour chocolate over bars and use a spatula to spread evenly. Freeze for an hour. Once the chocolate has set, gently remove the bars from the baking dish and transfer to a baking sheet, removing parchment paper. Top with halved marshmallows. Broil for about 45 seconds to a minute or until marshmallows are browned. Watch closely to avoid burning. Remove from oven and carefully slice into 9-12 bars. If you want the chocolate to firm up again, feel free to re-freeze until set. Store covered on the counter for up to 24 hours or refrigerate for longer. This post is sponsored by Bob’s Red Mill. Thanks for supporting the brands that make Hummusapien possible! Check out more delicious healthy recipes, snag coupons and find stores near you at BobsRedMill.com! Definitely making this sometime in the near future. Anything s’mores go straight in my belly. Yum! You charred those marshmallows so well! My boyfriend and I were just chatting about s’mores last night, so this is great timing hah! I’m drooling – and the fact that I don’t need an open flame. Yes sign me up right now!! All things s’mores all year round. Who needs season limits on food? I’m drooling here! I cannot wait to make these! Can I sub water for almond milk since I don’t have any almond milk? i do not have an outdoor grill or a pit, so oven based smores are everything! m going to make these very soon.. I made these last night. They were so good! Everyone in my family loved them. I made these the other night and they were so good! My family loved them. Making these right now, and I couldn’t stop trying them before I put them in the freezer! I can tell that these are going to be AMAZING ++ I might be eating more than one tonight. Love this recipe!! Oh my lanta… theses are giving me all the feels. Definitely need to make these ASAP!! They change the dessert game! I do a lil dance every time I grab one from my freezer stash. I really wanted to like these, but they just didn’t work out well for me. I was skeptical from the beginning about mixing together oats and graham cracker crumbs with almond milk – which is essentially water – and was not surprised when this combination yielded a mushy, wet crust instead of the supple dough I had hoped it would create. Additionally, the crust lacked flavor – the amount of graham crackers called for in comparison to the amount of oats is just not enough to impart any significant graham flavor, and the absence of any cinnamon or vanilla didn’t help. If I were to attempt this again, I would only use coconut oil, nut butter, or even dates as a binder for the crust, and maybe even bake this layer for a short time to evaporate any unwanted moisture. Sorry to hear you didn’t enjoy them. From your comment it sounded as if you only mixed the dry ingredients with almond milk, but the recipe calls for just as much cashew butter and also maple syrup. It’s supposed to be a moist, doughy consistency that’s a play on one of my most popular recipes, “cookie dough protein bars.” Most of the flavor comes from the chocolate and marshmallows.